Our clients asked us to look at adding 2 bedrooms and additional living space to their 3 bedroom house. They were also unhappy with the way the house addressed the street as the main house facade faced the back garden, and the main entrance to the house was beneath an ill-considered canopy adjacent to the garage. In order to address both of these issues, we removed the single storey lean-to that enclosed the garage and utility area and designed a 2 storey extension that used the same language as the existing house, with a pitched roof perpendicular to the existing. 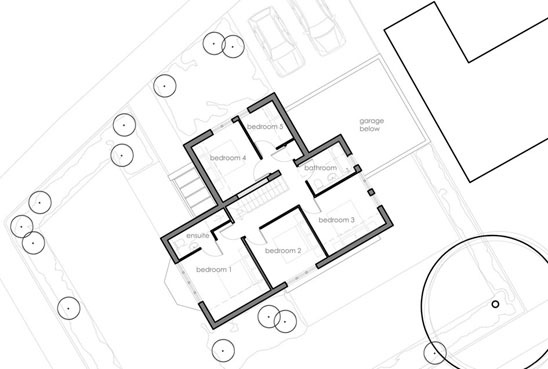 In addition, we designed a single storey element to house the new entrance, utility room and garage. In order to ensure that this is seen as a cohesive part of overall design and not a disparate add-on, the single storey element of the proposals has been conceived as a ‘garden wall’ that is breached by the 2 storey pitched roof section of the design. Internally, we reorganised the ground floor spaces to form an open plan living and dining space that opens up to the garden through a large section of fully glazed opening doors.